How Does Uber Eats Work? Quick And Easy Food Delivery? Home > Fun > How Does Uber Eats Work? Quick And Easy Food Delivery? In the last year, Uber Eats has seen explosive growth in the number of cities that offer their food delivery service. If you live in one of these cities and haven’t tried out Uber Eats, you may be wondering, how does Uber Eats work? We’ll give you the lowdown on how Uber Eats works for customers, drivers and partnering restaurants. Perhaps this service could be your new go-to for restaurant delivery. How Does Uber Eats Work For Customers? First, what is Uber Eats? Uber Eats is a relatively new food delivery service offered by Uber, the popular smartphone-enabled, ride-hailing company located in cities around the world. Uber Eats lets you order delivery from your favorite restaurants that may not otherwise offer home or office delivery. Browse through your local restaurant listings, or search for specific restaurants. Add your menu items to the cart. Once you’re done with your cart, you’ll see your address, an estimated delivery time, and the price of the order including tax and booking fee. Tap “Place your order,” and the app will use your card on file for payment. Follow your order in the app. First, you’ll see the restaurant accept and start prepping your items. Then, when your order is almost ready, a nearby Uber driver will head to the restaurant to pick it up. Once your Uber Eats driver is on his way, you’ll be able to see his name and photo and track his progress on the map. The process seems simple enough, right? But you may still have some questions. Here are some FAQ’s to help you with your Uber Eats experience. Does Uber Eats deliver to door? Your Uber Eats driver/cyclist will deliver your food to your door. If you prefer, you also can customize your delivery location by curbside or in the lobby. Can you order in advance? Yes. Uber Eats allows you to set up delivery ahead of time. You can order up to an hour before your desired delivery time and as much as a week in advance. How much does Uber Eats cost? Uber Eats charges a flat $5 “booking fee” per delivery to cover operational costs. Uber Eats occasionally charges a “busy fee” when certain areas of your city are experiencing a high volume of orders. These busy fees fluctuate depending on how many people want to use the service and how many delivery partners are on the road in that particular area. You can view the exact amount of the busy fee in the app before placing your order. Do you need to tip your Uber delivery person? You’re not required to make an Uber Eats tip — it’s entirely up to you. You can also write an Uber Eats review on their app rating your experience. Where Can You Find Uber Eats? 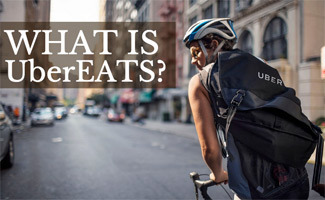 Uber Eats locations include 53 cities in the U.S., 30+ cities in Europe, and a handful of major cities in Asia, South America, Africa, Australia and New Zealand. The number of Uber Eats cities continues to multiply as the food delivery service grows more popular. Get $5 off your first two Uber Eats orders with promo code eats-64g9t. Just use this link to get started. How Does Uber Eats Work For Drivers? If you’re already an Uber driver, you’re in luck. You can do both — drive passengers and make food deliveries for Uber. If not, there are certain requirements to becoming a driver. In the case of Uber Eats, you can make food deliveries with a car, bike or scooter (depending on city laws), so it’s an excellent opportunity for car-less people to earn extra money as an independent contractor. What Are Uber Eats Driver Requirements? have a valid state driver’s license (but you don’t need a commercial license or CDL). be at least 19 years old in the USA and 21 in Canada. have one or more years of driving experience. be able to lift at least 30 pounds. Once accepted as an Uber driver, they’ll inspect your vehicle for safety, and you’ll have to complete their online training. Then, all you have to do is download the app and use it to “radio in” to Uber Eats dispatchers to get your deliveries up-and-running. Uber Eats drivers must buy their own gas and vehicle maintenance, but many enjoy the flexible schedule. Uber Eats driver pay varies by location, anywhere from $10 to $20 per hour. You can set your own rates, but they must be reasonable. Remember, you’re potentially competing with other Uber Eats drivers on the road. Tips aren’t included, and you’re not allowed to request tips. You can only accept tips upon the customer’s insistence. Uber pays weekly via PayPal or direct deposit. How Much Does Uber Eats Charge Restaurants? If you’re wondering how Uber Eats makes money, look no further than the fees it charges restaurants. While Uber takes a 25% commission on all of its drivers, the company also takes a hefty 30 percent cut of each order they deliver — a rate that’s significantly higher than competing food delivery services. Fees charged by popular sites like Seamless and Grubhub range from 12% to 24%, according to the New York Post. And rivals like Delivery.com, DoorDash, Postmates and Caviar charge fees ranging from 15% to 23%. Although the restaurant fees are hefty, many restaurants benefit from the marketing exposure they get from Uber Eats. In larger cities, restaurant owners should plan for an increase of 20 or more orders per day by signing up with Uber Eats. That’s where a partnership with the Uber brand can pay off in the long run. Check out the video below to see how restaurants have found success partnering with Uber Eats. Is Uber Eats Worth Joining? Based on our research, Uber Eats can be a lucrative enterprise for drivers and restaurants. For customers, we recommend signing up and trying them out at least once. You can get meals delivered from your favorite restaurants that you may not find delivery elsewhere. There’s no fee to join, so it’s definitely worth trying them out! What experiences have you had with Uber Eats? Artifact Uprising Review: Our Favorite Online Photo Book? If I am already an Uber driver can I also do UberEats? I’d love to add more service options to attract new riders in my area. Does anyone know? Hi Taylor, since you are already an Uber driver, you should be able to opt into UberEats from your dashboard. From what I can see on Uber’s website, you’ll need to login to your Uber Driver account and find Menu -> Deliveries to opt in. I’ve used UberEats a few times in DC and loved it! Would be great for those who want to make money but are concerned about safety of carrying passengers or don’t want to make small talk. Plus the few times I’ve used it the driver had a friend with them (to keep company maybe or to help deliver food?). And fun that you can deliver on your bike too (or at least I’ve seen UberEats delivery people on bikes here).